Every summer we slather layers of sunscreen with the highest SPF we can find, and bravely venture outside hoping our slimy cloak will shield us from the sun's death rays. So how does this work? TodayIFoundOut.com's resident medical expert, Scott, and a buddy of his recently started The Medicine Journal, where you can learn all sorts of interesting facts about all things medical related. Below is a sample article from their site. To start off, what is a sunburn? In the medical world, a sunburn is known as erythema. Basically meaning the redness of skin caused by dilatation and congestion of the capillaries, and is often a sign of inflammation or infection. Several things can cause your skins capillaries to become inflamed. Things like infection, allergies, mercury toxicity, tweezing or pulling on your hair follicles, and of course, the sun's ultraviolet rays. The ultraviolet (UV) rays that cause sunburns come in two forms. UV-A and UV-B. These rays, like all electromagnetic radiation, come in waves at specific frequencies. UV-A has wavelengths between 315-400 nanometers. UV-B wavelengths are between 280-315 nanometers. These wavelengths penetrate the skin and get absorbed at various depths. The damaging effects of sunlight generally reside in wavelengths between 290-400 nanometers. Our atmosphere actually does a pretty good job of filtering out most of the harmful UV radiation. 95% of the UV energy hitting the earth's surface is UV-A. The other 5% is UV-B. In fact, almost all of UV-B radiation is absorbed by our atmosphere. UV-A penetrates the skin more deeply than UV-B. That said, while UV-A does plenty of damage on its own, ray for ray, it's UV-B that causes more problems generally associated with exposure to the sun's rays, like skin cancer, aging, and DNA damage. It's also UV-B waves that are primarily responsible for your sunburned skin. How do these rays cause erythema and the pain that comes with it? UV-B wavelengths don't penetrate very deeply, but they cause photochemical reactions in your epidermis (the outer layer of your skin) and damages DNA. The body's natural response is to trigger several reactions by your immune system. The result is increased blood-flow to your capillary beds (vasodilation) and swelling (edema) which help in bringing certain cells that repair the damage. This also triggers the body to produce more melanin (skin pigment) to help in future exposures. The result of all this is the reddening of your skin. Another protein molecule, known as CXCL5, also triggers specific immune cells in response to UV-B radiation. It's thought that this molecule is what causes the pain and tenderness associated with your burn by stimulating the nerve endings in your skin. All of these reactions don't happen right away. They usually begin around 4 hours after exposure and peak between 8-24 hours. This is why you might feel fine right after you leave the beach, but by the time you hit the shower the next morning, your back looks like a tomato and the hot water feels like you're being burned at the stake. 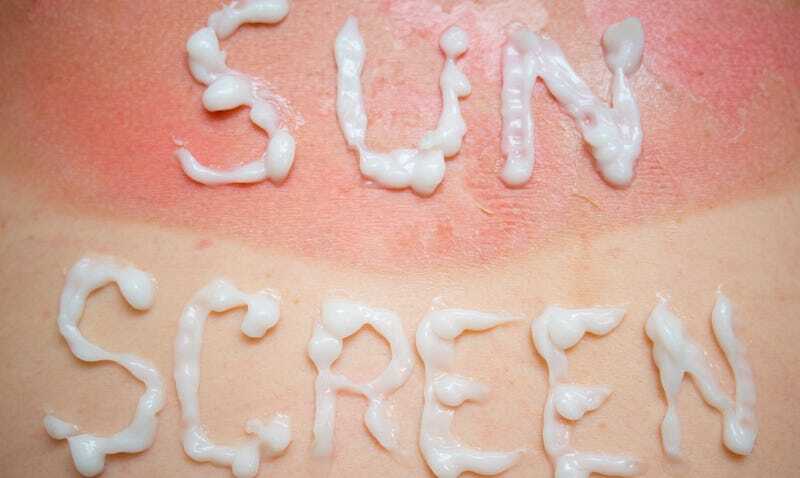 Sunscreen works in two ways to protect you from this. It either absorbs the UV wavelengths or scatters and reflects it. Two organic compounds that absorb UV-B light, and dissipate it as heat, are octyl methoxycinnamate and oxybenzone. Inorganic compounds that reflect and scatter UV-A radiation before the skin can absorb it includes zinc oxide and titanium oxide, among others. Depending on the specific makeup of your sunscreen, it will come with protection known as Sun Protection Factor (SPF). If you would normally burn in 10 minutes, a SPF of 15 would allow you protection up to 150 minutes. An SPF of 30 would allow you 300 minutes, and so on. Don't think, however, you are actually doubling your protection every time you double the SPF. As many consumer watch groups point out, an SPF of 15 filters out around 92% of UVB radiation. An SPF of 30 will only absorb about 96.7%, and an SPF of 40 will absorb 97.5%. They also point out that while sunscreens are often advertised as "Sun-Block", many are actually only blocking UV-B rays, and not UV-A. To make sure you're getting true broad spectrum protection, your sunscreen must contain both the organic compounds associated with UV-B absorption and the inorganic associated with UV-A reflection. Many that do this will specifically say they block both of these so you needn't necessarily remember which chemicals do what. If you're like me, you've never been scared of a little sunburn. In fact, you prefer it to the slimy skin associated with sunscreen. But be afraid, very afraid. Countless studies have shown exposure to the sun's harmful rays are responsible for early aging and an increased risk of skin cancer. You might think this risk is minimal. You're probably wrong. A review published in JAMA Dermatology in January of 2014 showed that exposure to the UV wavelengths associated with indoor tanning beds account for nearly twice as many skin cancer diagnosis as smoking does lung cancer in the United States- about 400,000 annually for tanning beds, compared to 200,000 from smoking. Further, even just one tanning bed session increases your risk of getting melanoma- the deadliest form of skin cancer- by 75%. This is why the American Medical Association, the American Academy of Pediatrics, the American Academy of Dermatology, the Skin Cancer Foundation, and the World Health Organization have all called on every state to ban children under 18 from using tanning salons. If you're also like me, you might try and justify not using sunscreen by saying; "Well, tanning booths primarily use UV-A radiation and emit it much more intensely than just standing out in the sun. Further, the damage by natural sunlight is caused mainly by UV-B waves. So I simply won't visit tanning booths, and, rather, burn my skin the natural way." Unfortunately, upwards of 90% of the visible changes commonly attributed to skin aging are thought to be caused by the sun. Combined with the fact that 1 in 5 Americans will develop skin cancer in their lifetime, with the sun being public enemy number one here, even natural sunlight should be fought off with copious amounts of sloppy, broad-spectrum, high SPF goo. Or, you could simply convert to living the life of a blogger, safely nestled away in our stereotypical mothers' basements. Does Cauterizing A Wound Really Work? The Medicine Journal writes for the wildly popular interesting fact website TodayIFoundOut.com. To subscribe to Today I Found Out's "Daily Knowledge" newsletter, click here or like them on Facebook here. You can also check 'em out on YouTube here.